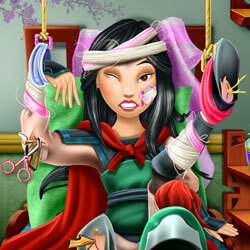 Description: Warrior Princess has been injured during a fight and she needs to find a doctor quickly. Help our princess heal her wounds using the best tools and medicine in all of China. Change her ripped clothes into a silk robe to begin the treatment, place casts on the broken bones and the brave warrior will be fully recovered.